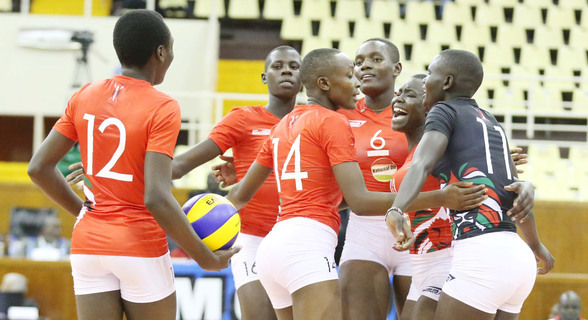 Kenya's Pamela Owino and Belinda Nanjala led Junior Malkia Strikers U20 to a resounding start against Tanzania winning 3:0 (25:15, 25:21, 25:11) at the ongoing Africa Women’s U20 Africa Championship tournament at the Kasarani Indoor Gymnasium on Sunday Afternoon. In the first set, Pamela Owino devastating thunderbolts were too much to handle as Kenya took Tanzania to the sword right from first service. The Kenyan team lost unnecessary points through unforced errors in service, a mistake the coach promised to work on. The third had Coach Gitau field a much full strength with Kenya cruising to victory on 25:11. In their next Africa Women’s U20 Africa Championship,nKenya face Nigeria on Wednesday Afternoon.